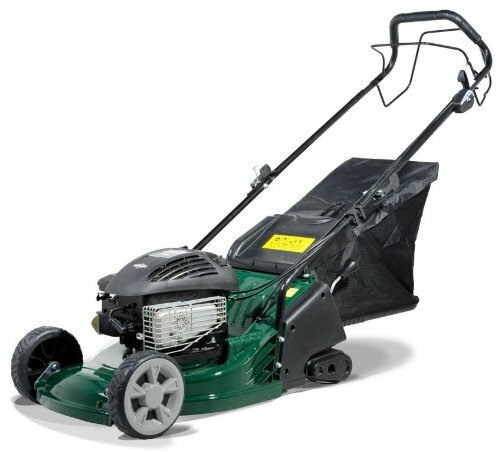 The Best Petrol Lawn Mower With a Roller? A reliable workhorse of a mower fitted with a 500 series Briggs and Stratton Engine, the Webb R17 petrol lawn mower is the perfect tool for achieving well defined lawn stripes on medium to large lawns thanks to it’s rear roller. Somewhat unusually the real wheels found on most mowers have been abandoned in favour of the roller alone, this helps particularly to keep a close eye on what you are doing as you mow each stripe, you can look directly below you and see the edges of the stripe in real time as the roller creates it, your view unobstructed by wheels. For this reason we consider this machine one of the best lawn mowers for creating stripes currently on the market. This is a quality machine with real emphasis on usability. 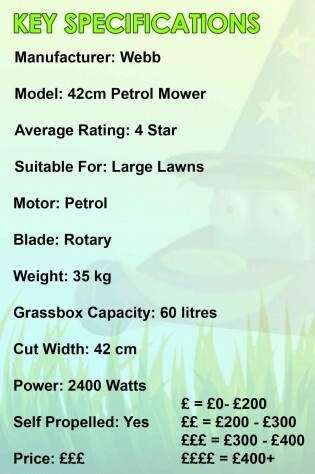 It’s not the lightest mower on the market, so it’s just as well that it’s self propelled. Once you get used to this feature, this mower is a real pleasure to use.